It's hard now to imagine a world without smartphones but, with few notable exceptions, it took Apple and its iPhone to really popularise the concept - and revolutionise the world of personal electronics in the process. 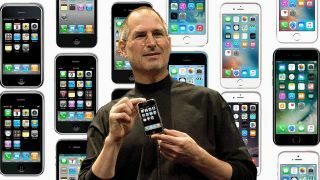 You may then find it even harder to comprehend that the iPhone is only 10 years old - a landmark which it reaches today with the anniversary of its unveiling at the 2007 Macworld expo. Ambitious as it was to deliver “a widescreen iPod with touch controls, a revolutionary mobile phone and a breakthrough internet communications device,” all in one back in 2007, it all seems rather quaint now - even down to the relative lack of bombast and polish that would surround a modern iPhone launch. Just check out poor Stan Sigman of Singular - he wouldn't get away with stumbling over flashcard prompts at a global Apple event these days. But Apple knew it was onto something special - today also marks the 10 years since it changed its name from Apple Computers Inc to simply Apple Inc, acknowledging that the lines between what a computer could be were about to change dramatically. “iPhone is an essential part of our customers' lives, and today more than ever it is redefining the way we communicate, entertain, work and live,” said Tim Cook, Apple’s current CEO, of the anniversary.